Sometimes you meet people on this job that change how you think about Art, Artists and stuff. It's unexpected. You see/ handle a piece of Art or meet someone through the work and you're humbled. Somehow things are different after wards. A friend emailed me with a question about a stone sculptor who might need help in moving large blocks of stone in his yard and studio. Because of medical issues he was no longer able to do it himself but the stone needed to be moved and they were wondering if I could help. I arranged a site visit, met the Artist and his wife, studied the stones and asked what they wanted. I have to say I was totally impressed. The stones were beautiful: pink, black and white marbles, all heavy, with a 3,200 lb. block in the yard and a 5,000 lb. rectangle waiting in the studio. The stones had to be moved from where they were in Takoma Park, Md. to California. It would be difficult. In his living room after discussing the project, I apologized for not being aware of his work. He had been carving for 30 years in one of my favorite Md. neighborhoods. I had lived in a nearby apt. and worked as an art handler in a warehouse a couple blocks away and didn't know him. Surprisingly, a student of my teacher Ken Campbell, who happened to be a next door neighbor, had even been the guy responsible for introducing him to the Art form. Hearing that guys name evoked strong memories of another time. I couldn't believe we had never met. Here was a guy who developed a passion for stone sculpture and built a life around it at his home. 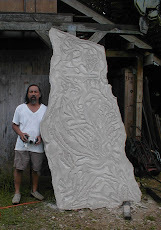 Stone carving is not easy, the work is difficult, messy and loud. Imagine hearing a hammer day and night in any neighborhood. It's a big investment especially when you start to work big. It takes effort, money and ambition. Looking at his place I saw he had added an i-beam from a second story floor extending out to his driveway. In his studio there were two i-beams with trolleys and chain falls. He told me he and his wife had moved those stones themselves and I believed him. He began to talk about how he had gotten the stones I had just looked at. The white marble came from a lot he purchased years ago from the Tomb of the Unknown Soldier, a monument in Arlington National Cemetary. He started with 40,000 lbs. and what I saw was what was left. He had sold and carved the rest. The U. of Md. had gotten the other half. I told him I was part of the team that unloaded that stone from a tractor trailer while I was a student there. I had carved blocks of it and had blocks left in my yard in WV waiting. I knew nothing about their origin. It was a 2 day project in December. Snow, icy rain and terribly cold both days. Trying to hold costs down, I brought one other art handler. I felt if he could bring those stones in, I could take those stones out. We rigged and packed all the stones that would travel on 4 site built pallets the first day. The second day, because of the small driveway, we parked the flatbed tractor trailer going to California in a lot a block away. Using my flatbed truck and a rented boom forklift, we shuttled the palletized stones from the house to the tractor trailer. Afterward, my friend said it was the hardest project we had ever done. Al Johnson, thank you very much for helping me understand what and why the work.